Macario Bernal stood on a new section of Interstate 65 in Louisville, Ky., taking in a sight that he’d been waiting 3 1/2 years to experience in person. Remembering a time when clogged bridges and interchanges made travel in the area a frustrating experience for motorists, Bernal almost couldn’t believe his eyes. One of the region’s most complex and expansive roadway infrastructure projects had been completed ahead of schedule and was ready to make life easier for commuters. Looking to the north, Bernal then fixed his vision on four additional lanes that weren’t even in use yet, realizing that the best was yet to come. 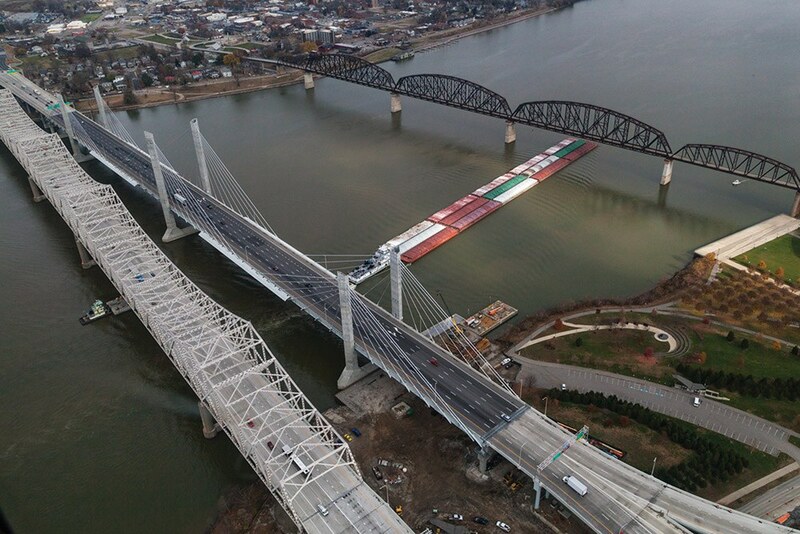 Precast concrete played a major role in the early completion of the Ohio River Bridges project. Photo courtesy of Aerial Innovations of TN and KY.
Bernal is happy too. He recently took the East End Crossing on a trip to Chicago and said the bypass reduced his commute by nearly 30 minutes. “It’s amazing how quickly you can get through the city now and how easily everything flows,” he said. Equally as amazing is the amount of time it took to improve the Ohio River crossing – an initiative that’s been on the wish list of both Kentucky and Indiana for decades. “Some of the people here have been waiting 40-plus years for this to happen,” Bernal said. Those individuals got their wish on Nov. 18 when the Downtown Crossing officially opened. The solution is comprised of the new Abraham Lincoln Bridge (which carries six lanes of northbound I-65 traffic) and the refurbished Kennedy Bridge (six lanes of southbound traffic). The project, which hit “substantial completion” in November, was finished a month ahead of schedule. With a lot of work to do within a short time frame, Bernal said the team of contractors, engineers and precasters pushed through and got everything opened up early. The new bridges improve interstate connections in the region while shortening commute times. Photo courtesy of Aerial Innovations of TN and KY.
Precast concrete played a key role in hitting the early completion date. Working on their respective parts of the project, A&T Concrete Supply Inc., County Materials Corp., Foster Supply, Gate Precast, Oldcastle Precast, Prestress Services Industries, S&S Precast Inc. and Sherman-Dixie Concrete Industries Inc. (now Forterra), all contributed to the project’s rapidity. Combined, these manufacturers produced many precast pieces for the project, including 40 acres of mechanically stabilized earth panels; 17 miles of beams; thousands of square feet of deck panels; box culverts and inlets; and reinforced concrete pipe and manholes. According to Bernal, one of the biggest advantages of using precast is that the material requires fewer connections during the prefabrication process. He added that inspection time is also minimized with precast, which presents less potential for errors. This, along with the speed of erection, helped ensure the project moved along at a rapid pace. Thinking back on the 3 1/2 years that Walsh Construction worked on the Ohio River Bridges project, Bernal said the undertaking – while monumental in scope – went smoothly considering all of the different designs, components and entities involved. He added that the result is nothing less than spectacular, both in terms of its functionality and how it’s been received by motorists. State and city leaders share Bernal’s enthusiasm for the project, which was not only completed ahead of schedule, but also within budget. Photo courtesy of Louisville-Southern Indiana Bridges Authority.